Maria Anholm was an author who combined national and international aspects in her writing. She was interested in both the social conditions of Swedish working women and the vulnerability of the Armenians and the Yazidi in the Caucasus. She was also amongst the first writers to use the term ‘folkmord’ (genocide) as a specific concept. Maria Anholm was born in Stockholm. She grew up within a merchant family. Although she trained at the Högre lärarinneseminar (advanced teacher-training programme) from 1868-1871, her main activity was writing. In 1882 she married the Danish naval officer William Anholm and they moved to Hellerup near Copenhagen. Their marriage did not last long, however, as her husband died just two years later. She never remarried and she never had any children. Maria Anholm stayed in Denmark, however. She wrote several books and wrote articles for both Danish and Swedish journals, including Dagny, Hertha, and Hemåt. She was also the editor of Kvinden och Samfundet, from 1900-1901. Her articles focused on subjects such maternity benefits, protective laws for women, summer camps for female industrial workers, female labour inspectors, and women’s wages within the industrial sphere. Upon receipt of a stipend from Stiftelsen Lars Hiertas Minne Maria Anholm was able to undertake a study trip to Germany and Switzerland in 1906. 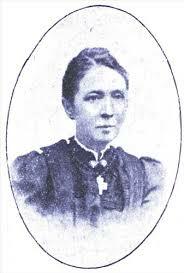 She visited various Catholic and Protestant homes for female industrial workers. Her book Fabriksarbeterskan, from 1907, describes the harmful impact of the physical and psycho-social surrounding on female factory workers. She believed that the factory management should be held accountable for morale at factories and that zeal for profit resulted in factory bosses not taking their responsibilities seriously. In her book she discusses the various homes she visited during her study trip abroad with regard to their enterprise, finances, regulations, religious affiliation, and the role of female directors. Maria Anholm also conveyed her desire to see these types of homes in Sweden. She emphasises the significance of cosy and safe accommodation, training, culture, nature, and the Christian faith to the health and development of female industrial workers, which would also benefit future generations of workers. Her book I anledning af en passus i yrkesfarekommitténs betänkande: Det personliga kapitalet och det sedliga ansvaret, from 1912, Maria Anholm continued her portrayal of working women’s working conditions. Maria Anholm’s social activism also found expression in articles submitted to Dagny in which she brought attention to the American philanthropic figurehead Jane Addam’s efforts at the Hull House settlement home which was in one of Chicago’s poorest quarters. Assistance was provided to the poor, in terms of breast-milk for infants, access to day care, employment agencies, and legal help. Maria Anholm undertook a lot of study trips. She visited Italy betwee 1878 and 1881 and again between 1885 and 1888, the Caucasus in 1893 and again over the course of 1901-1902, and France between 1891 and 1892. Her travels provided the basis for several travelogues and studies in which she also discussed research findings: Från Medelhafvets skönaste ö. Sicilianska reseskildringar och studier, from 1890, and I Gogs och Magogs land. Skildringar och studier från en resa i Kaukasus, from 1895, and Normandie, from 1889. Her book for young people, Vikingar och deras ättlingar, from 1892, won a prize from the Fredrika Bremerförbund (Fredrika Bremer association) in 1892. Following her second visit to the Caucasus Maria Anholm wrote a book about the Armenians called Det dödsdömda folkets saga, published in 1906. She described the so-called Hamidian massacres of 1894-1896 when between 100,000 and 150,000 Armenians were killed within the Ottoman empire. Maria Anholm used the term ‘folkmord’ (genocide) in the book in order to describe what had been perpetrated against the Armenians – she was probably the first person to use that term in Sweden. She placed the blame at the feet of the Turkish authorities and believed that they were ‘effectively running a war of extermination’. She also placed these events within a wider context of global-politics and believed that European involvement, intrigues, and mutual jealousy also lay behind these killings of Christians within the Ottoman empire. She predicted that the massacres would continue, and they did. In 1915 almost 2 million Armenians, Assyrians/Syrians/Chaldeans as well as Pontic- and Anatolian-Greeks were killed within the Ottoman empire. Maria Anholm was greatly interested in the Yazidi (which she erroneously named as ‘Jesids’). Her writings which described the origins of these peoples, their beliefs, their customs and habits, along with the founding of Svenska Jesidmissionen in 1922, successfully made many previously ignorant Swedes aware of these peoples, whom she sometimes described as ‘smutsfolket’ (the dirty people). She likened them to furtive, terrified, and impoverished rags. It was Maria Anholm’s sister, Ida Öberg – a physiotherapist who lived in Tbilisi – was the first person to inform Maria about the Yazidi. She, along with Wilhelm Sarwe a missionary with the Svenska Missionsförbund (SMF) (Swedish missionary society), began to hold ‘tea-evenings’ for the Yazidi. When Maria Anholm visited Tbilisi she was deeply moved by the plight of the Yazidi and ensured that Kvinnliga Missionsarbetare (KMA) (female missionary workers) supported the project as one of their mission duties. Following her sister’s death in 1904 a formal collaboration between KMA and SMF was established in 1905 in the Yazidi mission. They attempted to build a children’s home, founded a school, and provided health care for the villagers. The missionaries also held religious services for those Yazidi who were interested. During the First World War the Yazidi mission almost completely folded. KMA then asked Maria Anholm to set up an independent committee in 1922 whose sole purpose was to work for the Yazidi. Maria Anholm served as the chair of the committee, with Anna Roos as vice-chair, Margit Stenberg as treasurer, and Etty Ribbing, Helen Rubow, Anna Eurenius, and Eva Malmberg as ordinary members. The Svenska Jesidmissionen was based in Malmö and Maria Anholm went there every year to meet the board. When Denmark was occupied by German forces during the Second World War it was difficult for her to undertake these visits. Further, it was impossible to send material to where it was needed. Given that, at that point, she was quite elderly Maria Anholm also wanted to place the enterprise in ‘stronger hands’ and in 1945 a new board was assembled with three members: Arvid Bäfverfeldt from Svenska Kyrkans Missionstyrelse (mission board of the Swedish church), Georg Palmer from SMF, and Märta Josephson from KMA. Maria Anholm remained active on behalf of the Yazidi until her death. Maria Anholm died in 1946. The missionary work was then taken on by The United Mission in Mesopotamia, with financial support from Sweden, until 1952 at which time Svenska Jesidmissionen ceased its missionary work. Maria Anholm’s contributions on behalf of the Yazidi were only later brought to people’s attention, by the Swedish-Kurdish author Rohat Alakom, as well as others. Maria Elisabeth Anholm, www.skbl.se/sv/artikel/MariaAnholm, Svenskt kvinnobiografiskt lexikon (article by Maria Småberg), retrieved 2019-04-22.